Roy Graham, a grandson of Billy Graham, thanks visitors for taking time to honor his grandfather. Saying goodbye to Billy Graham wasn’t easy. 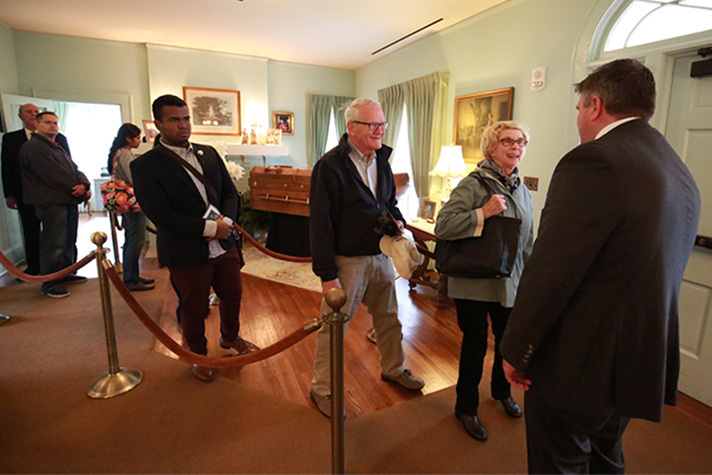 On his second day of lying in repose in the Graham Family Homeplace on the grounds of The Billy Graham Library, thousands came to pay their respects. Roy Graham, one of Billy Graham’s grandsons, greeted visitors inside his grandfather’s childhood home. >>Billy Graham will lie in honor in the U.S. Capitol Rotunda on Wednesday and Thursday, Feb. 28 and March 1. Get details. Just outside, Billy Graham Rapid Response Team chaplain Joseph Morrison summed it up. “When people come in, they’re smiling and when they come back out, they’re crying. 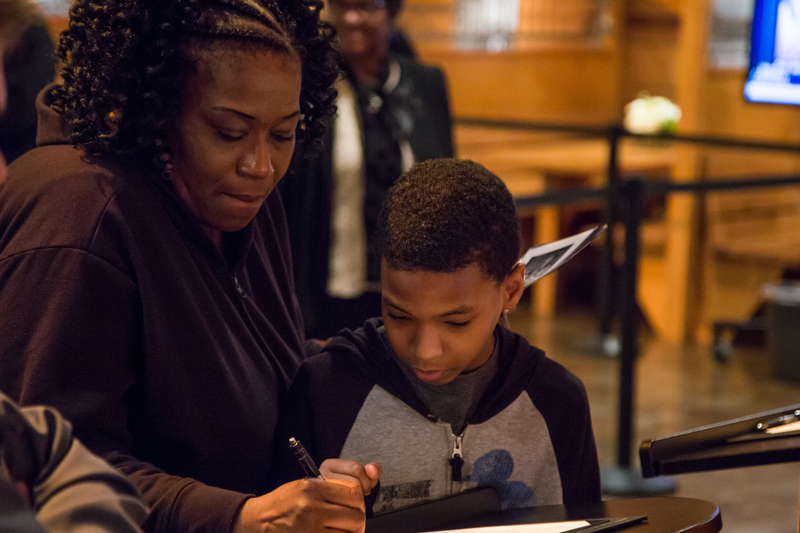 A young boy watches his mother sign the guest register. Jade Wilkinson, a visitor from nearby Gastonia, North Carolina, couldn’t stop crying. It was her second day here. She had come on Monday but didn’t leave feeling that she’d given enough thanks to a man who had meant so much to her and her family. Tuesday, Jade took more time—pausing at the casket and reflecting on Mr. Graham’s life. “This world doesn’t seem right now that he’s gone,” she said. “He comforted Americans in times of trouble—the Oklahoma City bombing, 9/11,” she continued. Laura Mapstead (right) shared how her grandmother prayed for Billy Graham’s ministry and sent him $5 a month for years. Today, Laura and her mother, Pat Evans (left) reflected on the evangelist’s life. 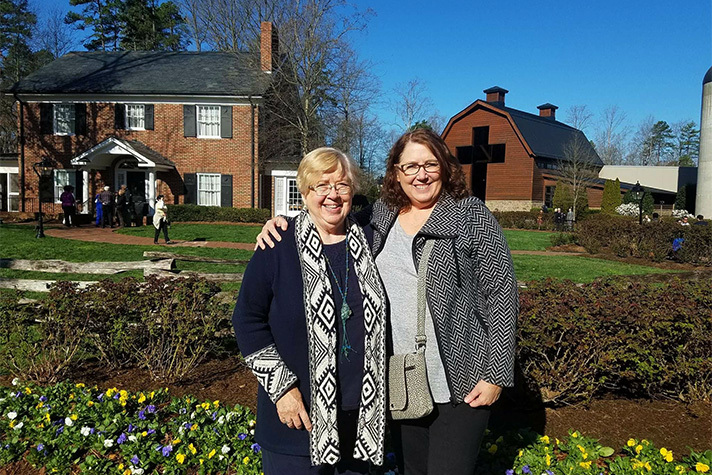 Another visitor, Laura Mapstead, recalled her grandmother’s love for Billy Graham. When she was around 10, Laura’s grandmother took her to a Billy Graham film and the message of salvation stirred Laura’s heart. “I remember going forward after the movie and praying with some Billy Graham workers to receive Christ as my Lord and Savior. 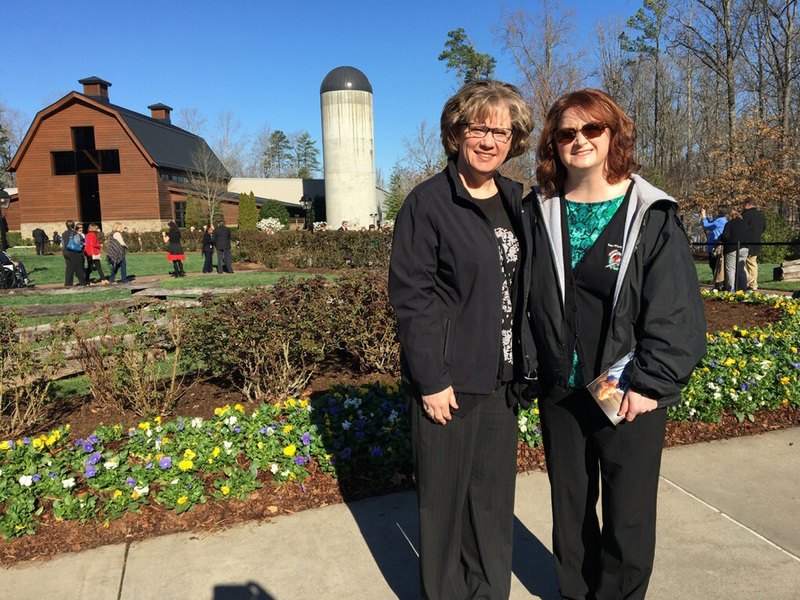 Sisters Sheri McGovern and Shana Lentz from Ohio said they appreciated the personal touch of meeting Roy Graham and the welcoming staff of the Billy Graham Library. Sisters Shana Lentz and Sheri McGovern flew in from Ohio to see Mr. Graham one last time. It’s the first picture in his baby book. Just the other day, he asked her to find that Billy Graham sermon on BillyGraham.org so he could listen to it. “It’s extremely special that Billy Graham constantly put Jesus forward, not himself, and kept to the Word and to the same message of Christ. Her sister, Sheri, said his passing can be used for good. “Hopefully this will light a fire again in a lot of people so even though he’s passed, his legacy lives on. “People can pick it up and tell about Jesus,” she said. Billy Graham chaplain Joseph Morrison is doing his part to share the comfort of Christ, praying with people who’ve come from across the country, Canada, Australia and elsewhere. “I’ve been meeting people from all over the world that have come just for this day,” he said. 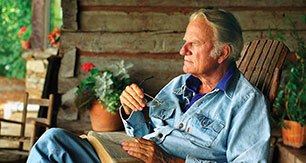 Find the peace with God Billy Graham knew.